YOU are the only one who can really ROCK your world. You already know this but still, you long for more aliveness. Maybe you are one of the genius ones that takes a lot to ‘wow’. Maybe you have ‘heard it and seen it’ all…almost. Perhaps you have done a bajillion online courses already, get bored, don’t finish the work and then feel like you are wasting your time. What if I told you there was a way to rock you story in such a way that you will never ever ever look at it the same way again. Kind of like a third eye adjustment. Because what you are seeing about yourself now is not what you will seen after Legend making. I am one of those smart ones too. A different divergent thinking woman that had to struggle to survive, let alone, fit in. I, like so many women, began consciously and unconsciously portioning off parts of my wild woman nature to be tended, “later when the world was safer”. Only the world didn’t get safer at all, the more we woke up to what was happening, the stranger it all seemed. But I made one decision that changed my life forever and charted a twenty year path of creative beingness. A path that would lead me to work with thousands of women sharing with them that same decision that I made. Perhaps you are curious just what that decision was? You craft a legend. You soul-smith a story worth living woven of hidden language, symbols, stardust, passion, intuition and paint. This time our caravan is setting out towards a very specific destination – your hidden stories, your taboos – the things the run you that you don’t even know are running you. Yep the deep dark dirty sultry hidden taboo stories that are shaping you in ways that you didn’t choose. Most of us aren’t even conscious of the stories that run us, and haven’t spent very much time crafting an identity either, but that is my favorite topic: making self. But when we get these stories conscious then we can actually DO something about our lives – and create the live we are longing to live. My work over the past twenty years has been dedicated to an inquiry about our stories – the hidden ones in particular – and healing, and how we can access the power to transform ourselves through choice instead of waiting for something bad to happen in order to be catalyzed. You can CHOOSE to transform your life into a legend, yes, as you suspect, I am inviting you to taste the secret sauce we are brewing over here in Cosmic Cowgirls Land. So pull a chair up to my table, I have tea and whiskey, and let me tell you a little bit about what I have planned for you. Guided by the usual suspects. P.S. This course is crazy. 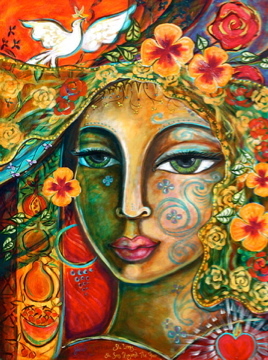 This time there are two video processes to choose from – one that I made about a year ago for the Color of Woman Teachers about painting your Legendary Self and a very special one from over 6 year ago (that was the first ever video painting process that I ever did – the original original me unplugged with the Color of Woman 13 steps.) You can choose either track – or both – and it has been years since we shared that earlier video process – but it is time because at some level that beginners mind makes it the best. This is the LAST time in 2014 this course will be offered, and it will never be offered this particular way again, so if creative action is a part of your Summer plans then let’s do this. This course is triple trouble. Jena’s deep taboo bustin’ journaling series combined with StellaMac’s Novella writing and my painting process is going to lead you to a new place with your personal story – somewhere you have NEVER been before. I mean it. This is different than you think. YOU will be different. Let me ask you a few questions to see if you are ready for this, because it is going to be big. I mean it! Is it TIME for a profound transformation at the level of HOW YOU UNDERSTAND your identity and how you relate to the Universe? Einstein says that there are two ways to experience the universe, as if nothing is a miracle or as if everything is a miracle, which one are you living through? Around here we believe that transformation begins right there: “IDENTITY”. 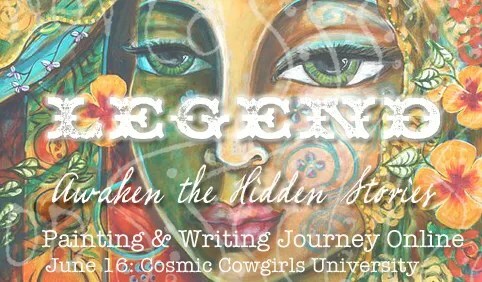 If that word has you shaking in your boots then you know what to do – join the Cosmic Cowgirls for LEGEND to explore it. Every woman has a deep desire to honor her own voice and express it, don’t you think. (Clearly I do.) Many of us have never been asked the question: What is YOUR LEGEND? let alone asked the question DO YOU WANT TO MAKE YOUR LIFE INTO A LEGEND? If more of us asked these questions of ourselves our lives would be so radiant it would blow our minds, because we are all SO F***king brilliant. How to access the sacred space where your stories live. How to get the shame and pain conscious so they can be alchemized and made useful. How to work with taboo in claiming who you have been and not been…for the good of who you will become. How to use own image as an oracle for learning things about you that you don’t know. How symbol can catalyze you right brain and left brain and activate your heart. So I have to ask now because that is what this page is designed to do, to ask you to join us on the journey into the domain of the Legendary Self. Ready, here goes. Will you say YES to 10 weeks to play, create, invent, paint, shape shift and let your wild Legendary self AWAKEN? All this magical mojo will be delivered in the delicious (albeit dangerous) company of a notorious tribe of creative women who call themselves the Cosmic Cowgirls. You might wonder how WE could make such a claim to legend making. I mean, really??? Everybody says they are teaching a life changing transformational course these days. Do the Cosmic Cowgirls think they are ‘all that’? (Yup.) You might be thinking, you mean, my super sucky or stuck or superficial or tired out soul-starved story can become a legend? How are you going to do that? Here’s the red HOT key. We don’t do it. You do. YOU DO IT. We give you the tools and you do it yourself that is why you can rock your world. And yes we have ridiculously honed, dangerously sharp blades for cutting out the trapping crap and precision needles for and strong braided red thread for stitching up the tears in the fabric of your story. These are specialized tools that are kept in the Cosmic Cowgirls barn for this kind of journey. Yes the one you are feeling called to in your bones right now. You might wonder if you can afford it, or if you will do the work or if we will deliver all that. But those questions are really not the point. The point is that it is time to get to know you, yes you. Until you do that your life will never reflect your deepest desires. Period. It can’t. It can only become what it is meant to be when you become who you are meant to be, and that story begins with Legend making. By popular demand, we are bringing back our newest incarnation of our Core Curriculum for a second run. This is the course that has created the Cosmic Cowgirls culture, a tribe of hundreds and hundreds of women worldwide leading legendary lives. Crafted from the formerly known “Leading a Legendary Life” – the new and updated version, LEGEND is now opening it’s doors. This 10 week online course focuses on intentional creativity as the access to your rich interior world of wisdom. Using painting, writing and creative journaling practices we will embark on a journey of legend crafting that will leave your “old story” in the dust. You will meet and work with your very own internal guidance system, the one we call – Your Legendary Self. Through connecting with this aspect of your identity you will cultivate the kind of AWAKE self-awareness you we all truly long for. To be awake inside of the experience of our lives is such a gift – and rare. After LEGEND you will have an alertness about who you are and your personal legend that will indeed, rock your future. A PROFOUND MYTHIC PAINTING of your Awakened Legendary Self – a beautiful larger than life symbol laden painting that you won’t believe you were capable of creating. Experience first hand the process that makes painting available for everyone – using Shiloh Sophia’s 13 Step Color of Woman Method – delivered in weekly video segments. This is the first core class required in the Color of Woman Training for 2015 – and we are making it available to you! For those who have done one or the other – this time around you get to choose which video series you want to work with! You don’t need any painting experience and you get to hang out with me and drink tea, read Women Who Run with the Wolves and dip your paintbrush in red paint. Sound good? IT is. The LEGEND CHRONICLES – You will be guided by StellaMac to write own Legendary Self Novella which will give you insight into the important pieces of your personal story that you are ready to write into your future. We are inviting you to create your LEGEND Chronicles – a three chapter Novella of the journey your Legendary Self will take to unveil these hidden stories and bring them into the light. The stories that have remained in the shadows because they have felt taboo. That you have ignored because they have seemed too scary to confront. That they felt too big or impossible to attain. When we use our right brain and left brain together (painting and writing) it makes uncovering the hidden stories more possible. We are able to bypass the critic and to hear the voice of our Muse, our Legendary Self. Even if you don’t identify yourself as a writer the power of the written word to delve deep into your own inner sanctum allows the wisdom of the Muse to rise above the howling of the critic. We invite you to join us to awaken your inner writer and meet your Legendary Self through: Writing practices to get your writing chops warmed up and support you in your writing from the perspective of your Legendary Self, that one that you meet through the painting process. Weekly writing prompts to guide you on the journey of of crafting your Legend Chronicles. Weekly Writing Labs to get feedback on your writing from StellaMac and your fellow journeyers. And Interviews with Writers about their process and get hints and tips on their writing experience. What else do we need to share? It is time to Awaken your Legendary Self. The Legendary Self journey is life changing. And when we choose to embark we know that we won’t be the same, nor look at things the same afterwards. Could be slightly dangerous. For sure to be emotionally confronting. Might cause you to want to make big changes. Or… it might be an invitation to begin deeply love what you already have but in new ways – to deepen into the bliss of existence. This isn’t about a NEW self. This is about calling forth the self that is already within you – she is knocking from the inside. Are you listening? Ready or not…you are invited to the tribe of the Cosmic Cowgirls…a sparkling red thread is extended from our hands to yours. I am so honored to be able to work with such incredible women leaders, and dear friends, Jenafer Joy and Stella Mac. The three of us together are at the head of the sparkling mothership we call Cosmic Cowgirls – a woman and girl owned University, Magazine, Tribe, and over all rock your world transformational educational community. Yes we think we are doing it right, and know why? Because we are having a GRAND time while doing to deep hard stuff that being human requires. We believe that transforming your life into a legend, can and should be fun – if at all possible. And we add glitter and chocolate as needed. Say yes to LEGEND 2014 right here. Q: How much time is required for this course? A: This course will roll out over 10 weeks starting June 16th 2014. You’ll have sequential access to both series of the painting videos. And each week will have writing prompts, discussions, and art Journal exercises. Phone Calls will be recorded All material will be available on the online site throughout the course and for 1 month after the course ends. Everything is optional and you can find the correct pace for yourself. We recommend between 1-3 hours each week. Q: What is the cost of the course? Are there payment plans or scholarships available? 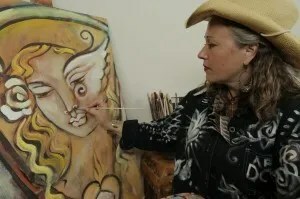 A: Combining Shiloh’s powerful 13 Step Color of Woman Painting Process with the wild and wise cosmic cowgirl community and deep inquiry makes this course an amazing value at $800, but if you act before May 28th, the cost is cut in half to $400. If you haven’t painted before and are starting without any supplies you can plan on spending an additional $200-$300 in paint canvas brushes and journal depending on store sales and how much you purchase. We are committed to making this course available to all women so we’re offering a 5 month payment plan ($160 $80 per month) with no finance charges. There are a few partial scholarships available as well – please contact jenaferjoy.cosmiccowgirls@gmail.com to discuss. Q: I participated in previous Cosmic Cowgirls Leading a Legendary Life courses. Is there a difference? A: Yep! The core content is the same – the steps, the intention, the catalytic community. But this course has a the option of either video series taking you through the 13 steps. It includes a new journaling process for busting your stories with Jenafer Joy. And full support for creating Your Legendary Chronicles with Stella Mac. You’re sure to remember what you previously revealed and discover a new depth of experience with the muse of YOUR legendary self. Q. What if I am applying to be in Color of Woman 2015? A. This is the first required painting course in the training – and this will be a chance to do it in community. And for those of you who wanted to do Color of Woman and didn’t get to – this is a perfect way to draw nearer to the training for next year. A: You will need a LARGE canvas (30×40), a rainbow of acrylic paints, brushes and a journal.